Shattered reputations, political wrangling, incestuous urges, religious corruption, madness, cannibalism and murder – oh, that all theatre was like this. If you are fan of the bloody tradition of the Renaissance revenge tragedy, taking inspiration from the gore-drenched works of Roman playwright Seneca, you may already know Webster’s The Duchess of Malfi. Set historically in the polluted font of Renaissance culture, the play follows the intrigues of a medieval noble house in Italy. The Duchess is a young widow, settled on secretly marrying her virtuous (and dishy) steward Antonio, but her politically ambitious and sexually obsessed brothers (respectively) seek to control her for their own ends. What begins as a romance, where the Duchess and her husband commit themselves to love in defiance of society’s demands, turns to tragedy and a particularly gory one at that. I had the fortune of seeing this after its run at the Globe as a recorded transmission. Many of the major theatrical and performing arts companies in the UK now film and relay their productions to theatres up and down the country. Catering for those who can’t get tickets for the pleasingly packed performances and screenings, they rescreen recordings as they did in this case. Since these relays began, the quality, scale and breadth of productions on offer has grown and Duchess is yet more evidence that these cinematic transmissions are proving a cultural boon. As you’d expect from a Globe production, it’s a fine staging. Though set 100 years prior to the era of its creation, the aesthetic is more steeped in the Renaissance than late medieval era, reflected in the fine costumes, versatile but minimal set (arras, of course, included) and live accompaniment by live Renaissance music. It serves very well to soak the audience in the opulence of the drama. 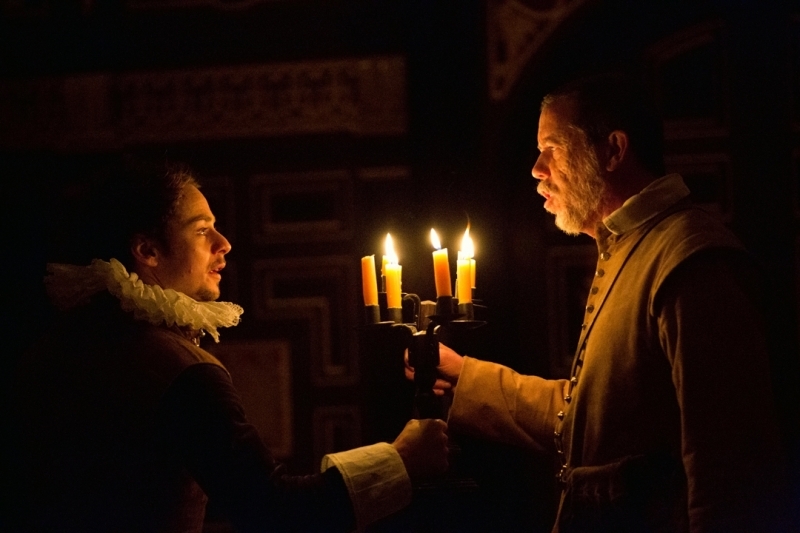 The play is a skewering and/or celebration of the perceived depravity of the Italian Renaissance and the production design is fitted well to evoke this rich and heady atmosphere. It’s an accomplishment to say this play never has a lull. Clocking in at 3 hours (some of the set changes have been edited down to save time in the recording) this is not a light piece, demanding sustained attention but managing its time very well. I am sure many have noticed that the longer tragedies of the era facilitate a certain reprieve in their structure to not exhaust the audience – Duchess is not such a creature. It starts as it means to go on, steadily mounting the pressure and eventually paying off in ever more gross displays of malicious violence. This sense of escalation and the refreshing tonal shift that occurs when the play refocuses on the response of Ferdinand and the Cardinal to their sister’s union is very effective at maintaining the audience’s attention. 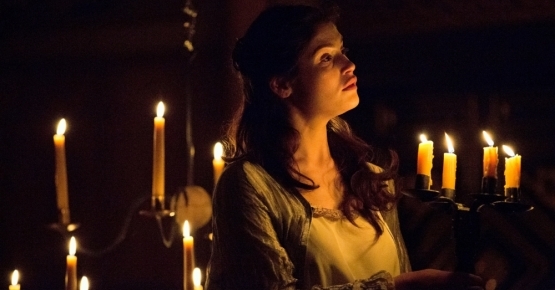 As the posters and promotional material loudly declare, the central figure in this production is Gemma Arterton as the Duchess. 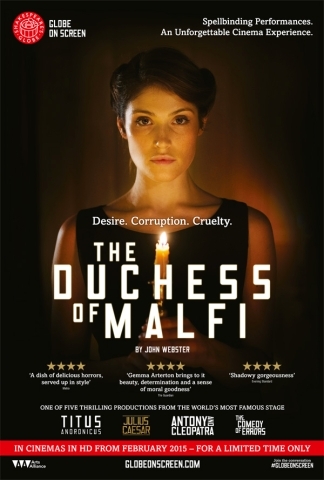 Dare I say The Duchess of Malfi is not the easiest play for the eponymous role to dominate in? The dramatic developments after the halfway point shift things to the court of her brothers and the constant machinations of Bosola throughout do have the character battling for prominence. It is a testament to Arterton that her Duchess is a lingering presence when offstage and always becomes the focal point of the action when she is onstage. Having said this, I have always reckoned Bosola to be the most difficult character for the actor playing him. His shifting allegiances always reek more of plot necessity and it takes a strong performance to ring the motivations out of his actions. 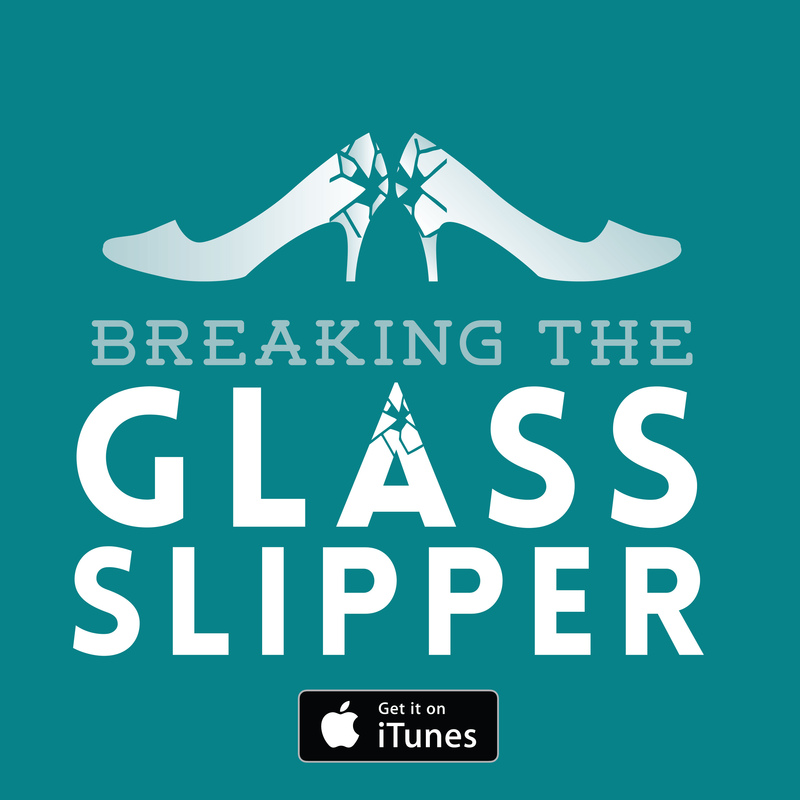 Sean Gilder admirably accomplishes this and has a rather fierce presence on stage. He bears something of a resemblance to Ron Perlman and is built comparably. One scene where he bodily hurls one of his victims across the stage was particularly shocking, attested to by the gasps of the cinematic and live audiences. Perhaps the one lapse is that this fierce work-horse version of Bosola does not quite align with other characters’ descriptions of him as an autodidactic scholar but those lines are quite miscellaneous in the scheme of the play so can be easily dismissed. Though Bosola’s conniving and penchant for violence is a source of joy in the play, the most salacious aspects come from the Duchess’ brothers. David Dawson is a particularly sickly Ferdinand. The reddening around his eyes coupled with his pallor convey a physiological aspect to his derangement, as his incestuous lust for his sister drives him to other prohibited acts of flesh of the Hannibal Lector variety. He’s a delightfully reptilian villain. 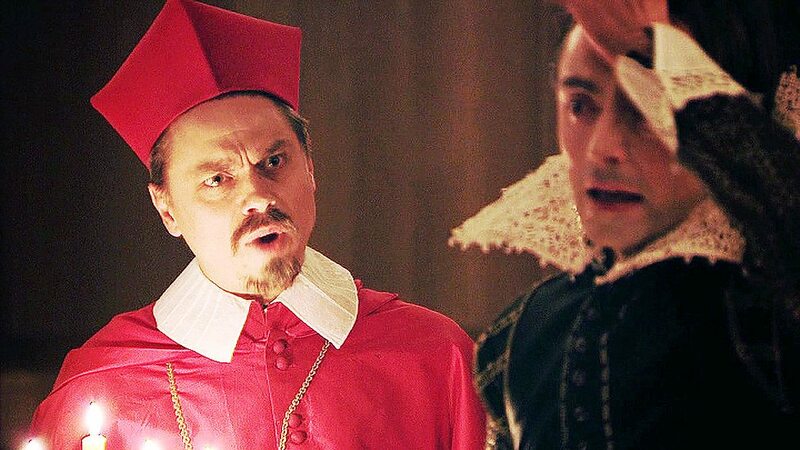 But my utmost favourite character of the play, as written and in this performance, is James Garnon’s Cardinal. The second brother is the cool Machiavellian plotter, but who manages to pile carnal affairs on top of his religious and political corruption. What is so delightful about Garnon’s rendering is the callous nonchalance with which the Cardinal goes about his dastardly business and that Garnon is ever able to play the audience with a calculated rise of his eyebrows. Playful yet threatening, and deliciously amoral, I could have watched Garnon for hours more! Verdict: If only all high art was this venal! Do check it out if it returns as a theatre transmission. 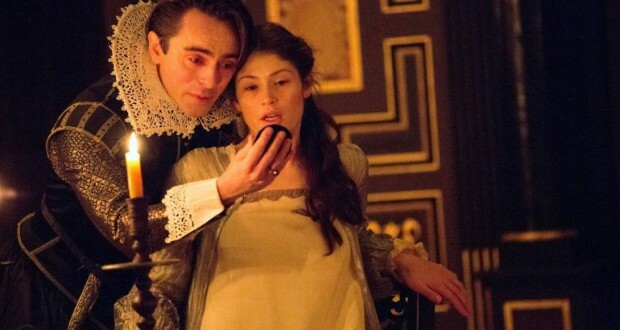 The Duchess of Malfi was staged by the Globe Theatre Company and broadcast via The Globe on Screen.